Most fathers are superheroes to their little girls. Daughters are treasures to their fathers, too, although they may also be the cause of a few sleepless nights. Since the father-daughter relationship is so extraordinary, when they have time to spend together, it’s important to make it special. Most fathers want to have fun with their daughters, but they also want to challenge them, build their confidence and add to their knowledge and skills. 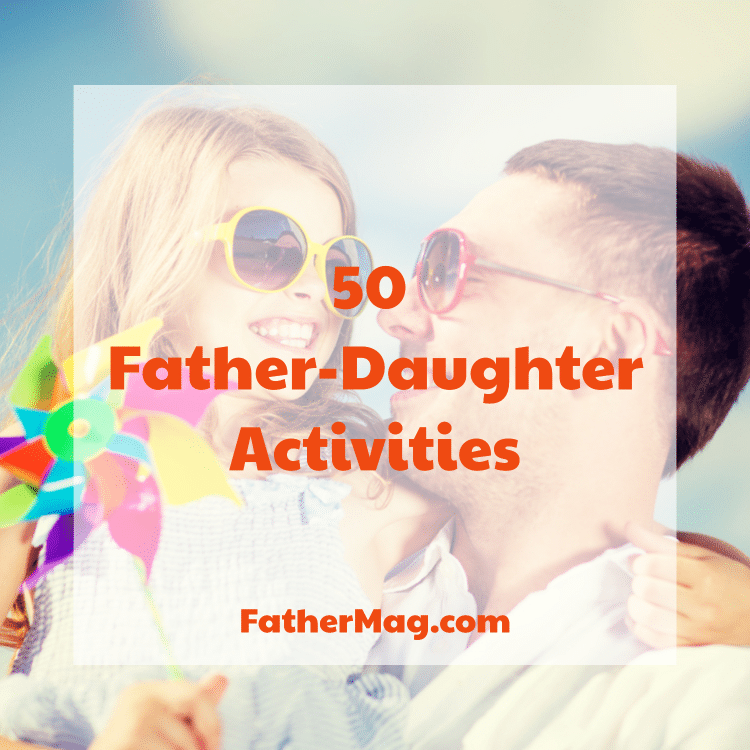 The father-daughter activities on this list are just what dad ordered. Some are suitable for little ones; others, for tweens and teens. Still, others can be adapted for any age. Browse the list, and you’ll be sure to find something perfect to do with your little lass. Save odds and ends of paper, plastic and crafting supplies and create a place where your daughter’s imagination can go wild. Add cardboard tubes, margarine tubs, and other recyclables. You’ll also need tools like scissors and supplies like glue. Be sure to take pictures of your daughter’s inventions. Use natural materials such as branches to create an outdoor fort. One design involves using long branches leaned against a large tree to create a triangular shape. Fill in with other branches. Branches with leaves still attached will create shade. No large trees around? You can push two forked branches into the ground. A long branch laid between the forks will create a framework to build upon. Then you’re ready to play Swiss Family Robinson or Survivor Man! If your daughter has a doctor kit and a few stuffed animals, you can play veterinarian. Add a couple of clipboards for charting and make a few signs for the “office.” If your daughter takes to this kind of play, you may end up researching animal ailments together. This simple pretend play could pique your daughter’s interest in the field of medicine. Take your daughter on a real camping trip, or have a backyard camp-out. Tents are inexpensive and much easier to put up than they used to be. Once you have your camp set up, you can go for a flashlight hike, listen for owls and tell stories around a firepit. Children never forget camping adventures. Scavenger hunts involve finding as many listed items as possible. The list for a nature scavenger hunt could include items such as a seed pod, acorn, shell, lichen, and feather. Look online for appropriate lists, or generate your own. Instead of physically collecting items, you can also use your phone to take pictures that document your finds. On a photo scavenger hunt, you can search for living creatures, such as bees, butterflies, spiders and birds, as well as for plants and inanimate objects. No matter which path you choose, you and your daughter can have an interesting walk while expanding your knowledge about nature. Thrift shopping is more like a treasure hunt than it is like traditional shopping. Look up your local resale shops and take your daughter on a search for inexpensive bounty. Books and puzzles are often good buys. You can also find clothing that is great for dress-up or cosplay. Your wallet won’t take much of a hit. Allow your daughter a set amount to spend, and she’ll get a lesson in budgeting, too. Pretending games are important to child development. Enter into your daughter’s make-believe enthusiastically, or initiate your own game. Just say, “Pretend that we are ___.” Your daughter will probably be delighted! Your pretend games don’t have to be geared to little princesses. Girls like adventure, too! Turn a walk in the neighborhood or in a local park into an adventure. Pack backpacks with water and supplies. Bring trail mix, binoculars, a compass and a ground cloth for taking a break. Use your phone or fitness tracker to record your miles. Find some fun fitness activities to do with your daughter. Besides jogging, biking, and walking, you can do simple calisthenics. When your daughter is old enough, teach her how to use weights properly. Weight training is safe for children over 7 if small weights are used. Never turn lifting weights into a competition, and never criticize her performance in any athletic activity. Make your sessions enjoyable, and you’ll have a fitness partner for life. Storytelling is great for language development. Let younger children tell their stories while you record them on your phone or other device. Then you can turn them into written form. You can even make them into books! Older children can write down their own tales, with you serving as enthusiastic audience. If you have a reluctant writer, try this trick. Write down a sentence, then let your child continue the story with another sentence. Continue the process until you have a story. With older children, you can alternate paragraphs instead of sentences. If your daughter has a creative bent and some patience, try stop action video. All you need is an inexpensive app and your smartphone or a tablet or digital camera. Show her how to pose a doll or miniature figure and take a picture, then move it a tiny bit and take another picture. When the pictures are put together, she will have created a short animated segment. After you start with a simple app, you can move her to a more sophisticated setup if she is interested. Someday you could have a filmmaker in the family! When you think your daughter has had enough screen time, break out the board games. There are games that are suitable for all ages and levels. Many of the classics that you played as a kid are still perfect for kids today, but there are innovative new games, too. Board games teach logic and strategy as well as reading and math. They also teach children how to be good sports. Want to take it a step further? You and your daughter can make your own board game. If you are handy with woodworking, you can probably think up a simple project for the two of you. If not, you can find kits online and in home improvement stores. By the way, some home improvement stores offer free workshops for kids on Saturday mornings. Of course, the zoo is a favorite spot for most kids. You can make it even more fun by checking out the extras that may be offered. Many zoos have special lighting events or seasonal nighttime hours. Other extras may include zookeeper chats, behind-the-scene tours or animal encounters. Your daughter may be able to feed the giraffes at some zoos. Some extras are pricey. Others are free with the price of admission. Most kids are interested in how things are made. Factory tours can answer some of their questions. Check your area to see what is available, or work in a tour on your next vacation. You can tour factories that make automobiles, airplanes, guitars, baseball bats and motorcycles, just to mention a few products. Visits to ice cream and candy factories are bound to be a hit. You can also tour the U.S. Mints in Denver and Philadelphia and learn how money is made. Catching and throwing a ball is an excellent activity for building eye-hand coordination and improving balance. There are ball activities for all ages and all levels of interest. You can opt for a relaxed game of toss or get your daughter involved in team ball. Most classes are designed for adults or children, but with a little effort you can arrange lessons with your daughter. It may mean arranging for private sessions. Cooking and sewing classes are offered in most areas. Painting and pottery classes are also popular, or you can choose something physical like martial arts or tennis. If it’s not strictly prohibited, take your daughter to work with you one day. Depending upon your child’s age, it may be wise to choose a day when you can arrive late or leave early. Children should know something about their parents’ working lives. Music is the universal language, they say, so sharing it is a perfect way to bond with your daughter. If your child is quite young, choose a children’s artist. When she is older, you and she will probably enjoy some of the same artists. Outdoor concerts tend to be kid-friendly. The tunes are likely to be rated G, and you can leave whenever your daughter gets tired. Later you can go for other concert venues. If you start your daughter young, there’s a good chance that music is a bond the two of you will share for life. You don’t want your daughter to be left out of the push for STEM learning. Science experiments are a great way to capture her interest and teach her something, too. Opt for a classic, like the baking soda and vinegar reaction, or do an online search for something more innovative. You can also buy kits that contain materials for several experiments. Rock climbing gyms offer an exciting experience that is safe for children as long as you supervise them carefully and follow the rules. Some gyms require that children be a certain age, usually between 5 and 8, for admission. Most gyms use a combination of a harness and an auto-belay system for their youngest climbers. Climbing is good exercise and can help children conquer their fears. Bowling is a classic sport that has been entertaining children and adults for ages. Most bowling alleys accommodate their youngest customers with bumpers that keep balls from going into the gutter. Children should be encouraged to try bumper-less bowling as soon as they are able, however, as bowling with bumpers won’t help them advance in skill. Take your daughter to a sporting event. The choices are unlimited! If you don’t want to spend a lot, opt for a high school team or other local team. Be sure to introduce your daughter to all the customs of the game, whether it be the seventh inning stretch or the wave. And, of course, be sure to hit the snack bar and souvenir table. You get bonus points for taking her to see a women’s team. Live theater is a completely different experience from a movie. Your daughter should have the chance to experience both. Find low-cost theater productions at high schools and colleges or look for local amateur groups. The performances can be outstanding. Of course, if you have the access and the ticket money, seeing a Broadway-caliber performance can be an unforgettable experience. Farms that let visitors pick their own produce combine fun and learning. Your daughter will enjoy tasting fruits and vegetables that she has picked herself. Many times pick-your-own farms offer special features like hayrides, playgrounds, picnic spots and fishing ponds. It’s possible to turn a picking expedition into a full day of recreation. You can go two directions with miniature golf. You can find the most outrageous course you can and go just for the yuks, or you can opt for a course that takes the sport more seriously. No matter which way you choose, you and your daughter will have a ball. Have you heard of cosplay? The term was created by combining costume and play. Most aficionados dress up like their favorite characters and meet up at cons, which is short for conventions. Early cosplay centered around anime or science fiction characters, but it has gone more mainstream, with superheroes and other cartoon characters as popular choices. Before you take your daughter to a con, investigate whether it is family friendly. Then prepare to be entertained! Find out what visitors do when they come to your town or city. You can start with your city tourism department or chamber of commerce. Chances are that you haven’t done all of the activities that you will discover. Pretend to be a tourist and check out the local attractions. You can make it more authentic by staying in a motel or hotel overnight. And don’t forget to make like a tourist and take lots of pictures! Sure, everyone jokes about dad jokes, but younger kids will eat them up. Older kids may groan, but they will giggle, too. You may want to specialize in a certain type of joke, such as knock-knocks or bad puns. Reward your daughter when she comes back with a joke of her own. Now you’re laughing! If you get a breezy day, try teaching your daughter to fly a kite. Choose a simple model of kite and be sure to fly it in an area that is free of power lines. Once she has mastered the basics, you can move to a more exotic model. A trip to the park or playground is more enjoyable if you add a picnic to the festivities. Fresh fruit and sandwiches make a simple and healthful menu. Want to make it extra special? Invest in a classic picnic basket and a nice ground cloth. Then all you have to do is watch for ants! Shopping for groceries with your daughter can be a learning experience for both of you! Add excitement by visiting on the weekend, when many supermarkets hand out free samples and sometimes have other activities going on. You can also take your daughter to an ethnic grocery store and buy something that you’ve never tried before. Unusual fruits, snack foods and bakery items are good starter foods for trying out different cuisines. Find a jigsaw that is age-appropriate and do it together. If you manage to finish a big one, glue it to a backing and display it proudly. If two-dimensional puzzles are no challenge, try a 3D puzzle. Kids usually love children’s museums and natural history museums, but don’t stop there. Try art museums and history museums, too. It’s hard to predict what will pique your daughter’s interest. Also check for offbeat museums in your area. Any time you visit a museum, check out the museum’s dining options. Instead of boring cafeterias, many museums now advertise innovative eateries. Also, most have gift shops with lots of fascinating items. Doing something good for the planet is as simple as going for a walk and picking up litter. Be sure to wear gloves and bring some for your daughter, too. You can buy grabbers for her to use if you are nervous about her handling trash. The two of you can also join a community-wide cleanup. Teach your daughter classic playground games like hopscotch and hide-and-seek. If you have a few extras kids around, you can play duck-duck-goose, Simon says, freeze tag and other games that are meant for a group. Buy your daughter a jump rope and teach her some classic jump rope rhymes. Individual jump ropes will work, but the longer ropes like those used on playgrounds are even more fun. If you don’t have an extra person around to hold the other end of a long jump rope, you can tie it to something that is about waist high and do a fair job of turning the rope by yourself. Whether you will take a turn jumping is up to you! Children of all ages love to blow bubbles. Little ones are fascinated by the novelty of it, and older children often find it relaxing after a stressful day at school. Buy dime store bubbles, or combine bubble blowing with a science experiment by making your own. This modern-day treasure hunt involves using a hand-held GPS to find caches left by other enthusiasts. You can also use your smart phone. Just download a geocaching app, and you’re ready to go. Most geocachers leave small trinkets in their caches. The rule is if you take a trinket, you have to replace it, so you may need to make a trip to a dollar store, too. How many swimming pools do you have access to? Find out, and take your daughter to visit each one. In addition to neighborhood or municipal pools, check local colleges, high schools, YMCAs and fitness centers. You may have to pay a small drop-in fee, but it will be worth it to find your favorite swim spot. Using a heated pool during the winter months is an especially nice treat. If your daughter’s age is still in the single digits, you can do the same thing with splash pads. Visit a beach with your daughter and try your hand at sand castle construction. You’ll need shovels and buckets, plus a spray bottle to keep the sand moist while you work with it. If you want to get really fancy, add tools such as putty knives for making patterns and paintbrushes for brushing away the loose sand. Be sure to take a picture of your masterpiece, because the tide will come in! Introduce your daughter to fishing. You can start her off with a simple closed-face spinning reel or go even simpler with a cane pole with no reel. Find a pier or park that is beginner-friendly. The locals will be happy to give you advice if you need it. Don’t forget to buy your fishing license! Visit a state or national park or forest near you. Start at the visitors’ center, where you can get detailed information about the area, including learning about local wildlife and birds. Then hike, bike, fish or canoe, or take advantage of any unique recreational opportunities in the area. Working together in the garden is one of the best bonding experiences for fathers and daughters. If you don’t have room for a garden, you can do container gardening. Some pint-sized gardeners like flowers; others gravitate toward vegetables. Herbs are another favorite because of the nice smells. If you want an even simpler form of gardening, use your produce scraps such as carrot tops and avocado pits to make a windowsill garden. When cooking with your daughter, start small so she won’t be overwhelmed. Make one dish or dessert together, then work up to creating an entire meal when she is old enough. Be sure to include her in the planning and in the cleanup! Washing up is an essential part of cooking. There’s something about being on the water that creates special memories. You don’t have to own your own boat to enjoy an outing with your daughter. You can go on a commercial boat tour or simply rent a paddle boat, kayak or canoe. Be sure to use well-fitted life jackets. Skating can be a great shared activity for fathers and daughters, whether you visit a rink or buy your own inline skates for outdoor gliding. In certain parts of the country, ice skating is a popular option. Scooters, skateboards and caster boards can also be great fun. Be sure that your daughter wears proper protective gear, including helmet, elbow pads and knee pads. Of course you’ll read to and with your daughter when she is young, but don’t discard the practice when she is older. Many young adult novels are exciting enough to keep anyone’s interest. You can read aloud to each other or read separately but at the same time. If you are traveling together, download an audiobook to make the miles go more quickly. Of course, you’ll want to discuss what you are reading. If there is a movie or a sequel, you can enjoy those together, too. Many libraries are now called media centers, because they have much more than books. You may be able to borrow movies, audio books, music CDs, video games, puzzles and board games, as well as traditional volumes. Younger kids will enjoy Story Time. Be sure to sign your daughter up for Summer Reading Club! Many non-profits will accept child volunteers, especially if the parent signs up, too. Check out charitable operations such as local food pantries and clothing closets. Some organizations bring children and nursing home residents together. Running a 5K or 10K for charity is another worthwhile endeavor. Doing well together is simply the best! Sometimes you will plan an activity, and it won’t go well. Maybe your daughter is not feeling well or is over-tired. Perhaps what you have planned simply does not pique her interest. You have to expect a few misses among the hits. Also, sometimes you will think that your planned activity didn’t measure up, only to find that your daughter has the fondest memories of that day. You’re not expected to be perfect, only to be a loving father who tries his best, and you have that covered!